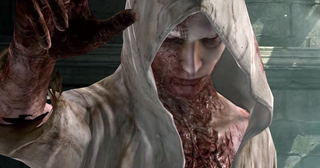 Hint: In spooky-scary Shinji Mikami survival-horror The Evil Within, it's a pretty big one. If your Internet connection is non-existent/unreliable, this is probably not the best news. "Version 1.0 actually runs 30 to 40 per cent slower than the same game running with the day one patch. Scenes that manage to deliver an even 30fps in version 1.01 lurch along at an awful 20fps instead. Dips and stutters in the current version drop all the way down into the teens." "It gets worse. The original release doesn't even operate at native resolution. We pegged version 1.01 at 1920x768, delivering 1:1 pixel mapping by displaying at 1080p with large black bars framing the action. Version 1.0? It runs at 1600x900, anamorphically squished into a 1920x768 window." There are also weird pauses in gameplay and frequent framerate drops to top it all off. Apparently at certain points it's very hard to do basic things like aim smoothly. The issue here is that players get a game with some pretty serious performance issues if they don't go through with the patching process. Granted, we live in the year 2014, so a lot of people staple a few new gigabytes to their game and get on with their lives, but not everybody has reliable Internet access all the time. Even beyond that, it's kinda wild to me that a high-profile game could end up on shelves in such a poor state. That idea just feels... off to me, especially given that one day the servers that deliver these patch downloads could be taken offline. Then what? I'm not sure if it's something we should be OK with. Has anyone else tried playing The Evil Within this way? Or any other game where the day-one update isn't mandatory? Do you think people should expect higher standards from games off the shelf, free of updates?